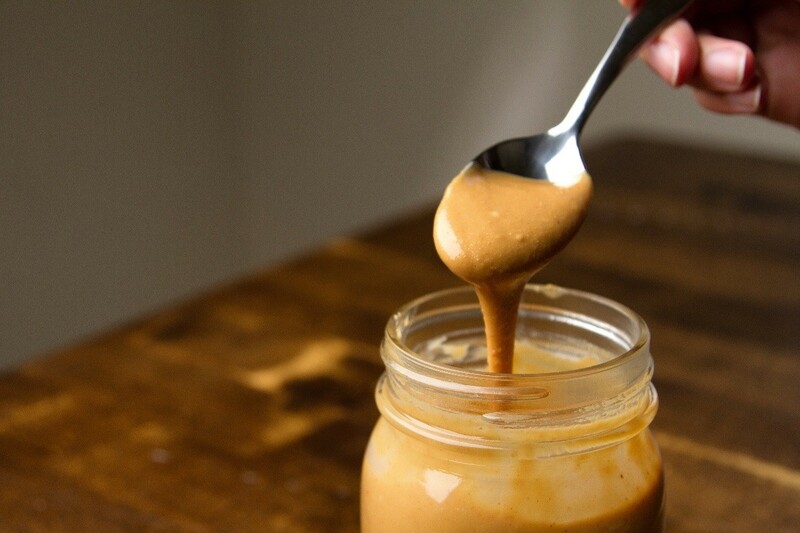 Storing peanut butter can depend on personal preference or the type you buy. This is a guide about storing peanut butter. I have read that people will turn their natural peanut butter jars upside down (and store it that way in the cabinet) so that when the time comes to open the jar, they don't have to mix it. I did that and, after opening and refrigeration, found the oil had risen to the top again. Just to be on the safe side, I put my jar back in the fridge in a bowl, upside down and cap tightly screwed on, to see if the oil would rise to the top and re-mixing the rock hard, cold peanut butter would not be required. Well, I am happy to report that storing it in the fridge upside down has caused the PB oil to rise to the top (which is the bottom of the jar) and this produces a slightly lower fat product. When I get to the oily part on the bottom of the near empty jar, I remove it and use the jar to the end. I would suggest that you check the consistency of the PB at the very bottom of the jar, as it sometimes needs a smidge of the oil mixed back in to become pliable. To date, none of the PB upside down jars have leaked. However, if you share the PB with other family members, they may not be as cautious as you by tightening the lid.